Goodbye worker bending over the hole. and the gas that goes in it. and the rebar inside it. Goodbye waiting for concrete to cure. and Goodbye waiting for footing inspections. Goodbye old-school deck footings everywhere. 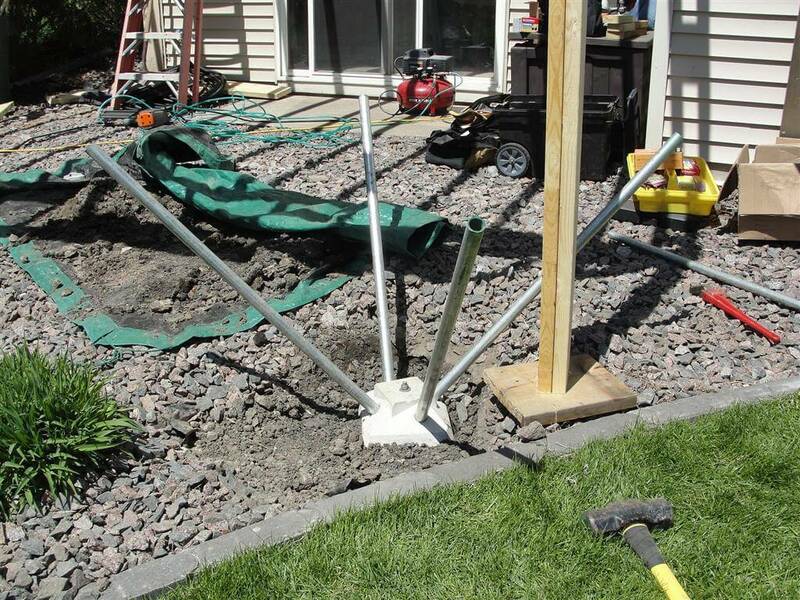 OK, I don't really think standard footings are going to become a thing of the past just yet, but there's a cool new product in town that's making deck footings way faster and easier to install; it's called a Diamond Pier® Foundation System. A Diamond Pier is basically just a small piece of concrete with four holes in it. Long steel pins get driven through the holes at 45 degree angles, and these pins make the small chunk of concrete as strong as an 18" round footing, assuming it's the smallest Diamond Pier made, the DP-50. No joke. When I first learned about this foundation system I could understand how this might be able to hold a lot of weight, but my real concern was with frost heave. As I mentioned in my blog post on frost heave and deck footings last week, frost heave can be a serious problem with decks here in Minnesota. Diamond Pier foundation systems were introduced in to the residential market approximately ten years ago, and have been used in various cities here in Minnesota since 2007 to help gain ICC approval. Of the nine deck installations listed in Diamond Pier's frost performance reports, four of the nine examples took place in Maple Grove. I spoke with two building officials at the City of Maple Grove who said that in all the cases that have been closely followed for the last five years, there was only one documented failure of a single footing, and it was more due to 'user error' than anything else; the homeowner had a downspout discharging right next to the footing (no-no). My next door neighbors had a deck that heaved so badly last year that the patio door wouldn't even open, and their deck stairway became downright scary to use because it was so badly tilted. They tore their deck down last month and had it re-built, this time with a Diamond Pier foundation system. The photo below shows one of the piers being installed; after digging out a little bit of rock and dirt, the pier gets placed in the earth. To help keep the pier steady, the pins need to get tapped in to the earth a little bit with a drilling hammer or sledge hammer, but they're not supposed to be fully driven in to the earth that way. A demolition hammer needs to be used in conjunction with a specialized driving bit, shown below, to drive the pins into the earth. The video clip below shows the pier being installed, along with the coaching of local Diamond Pier rep Ralph Schmidt. First they tap the pins in to place, then drive them in using a demo hammer. Diamond Piers are available in lumber centers throughout Minnesota, and I think they're well worth the extra money when compared to the amount of work involved with standard footings. Prices vary, but Hamel Lumber sells the DP-50 for $115.75 each, and they offer free use of the driving bit if the pier footings are purchased from them. After hearing the rave reviews of this product from contractors and building officials, I think I'm pretty much sold. If I ever have an upcoming project where these would make sense, I wouldn't hesitate to try them. Diamond Piers can still experience frost heave, but they perform as well as or better than properly installed traditional footings. I'll try to post follow-up photos of my neighbors' deck each year on this blog post to show how the pier footings are holding up.